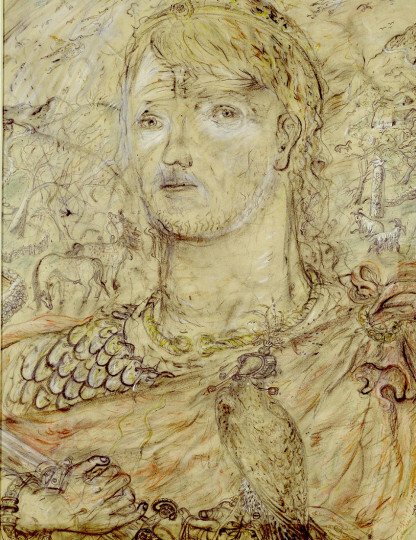 This drawing expresses David Jones’ preoccupation with the overlap between Roman and Christian eras in Britain, and the idea that the Roman Imperium was the nest for Christianity. These are themes that he expanded his second great literary work, The Anathemata, written in a surge of literary effort between 1948 and 1951. In The Lord of Venedotia Jones casts the Lord Jesus Christ in a local light; in a footnote to The Anathemata he makes reference to the story of this warrior prince, drawing together Celtic, Roman and Christian histories. It is generally accepted that the man known to Welsh tradition as Cunedda Wledig was a Romanized Briton, almost certainly a Christian, and possibly associated with the office of Dux Britanniarum. Sometime before the year AD 400, he came, presumably under Roman auspices, from the district of the Otadini or Votadini in South Scotland, into Venedotia (N. Wales). His great-grandfather, his father and three of his nine(?) sons and one of his grandsons bore Roman names; two of which, Donatus and Marianus, are said to be certainly of Christian provenance. The rule which these men established for Wales, in the age of St Ambrose, was destined to evolve into a dynasty of native princes, which endured, in however precarious fashion, for nine centuries. In this portrait, Jones identifies the Lord with the lie of the land. The flow of his drapery describes the wind, while his whole demeanor, from armour to hair, and the scrubby landscape beyond are united by a worn texture, redolent of the wear and tear of history. Animals in the landscape (ponies, sheep, birds in flight) seem to fill in the gaps, adding a sense of density rather than distance. The very expansiveness of the drawing, right to the edges of the paper, reflects Jones’ interest in the interwoven structure of medieval Welsh poetry and the de-centralised patterning styles of Celtic manuscripts. And while the pencil strokes appear gentle, timorous even, there is a sense of struggle and persistence in the way that Jones has worked away at the paper. Its tawny ground is enhanced in places by white body-colour: from fleeces to jawline, damp streaks, and sword, this has neither a thickening or brightening effect, but swells the aesthetic of intermingling.